We at Shop Floor Automations know that your legacy machines are important to you. 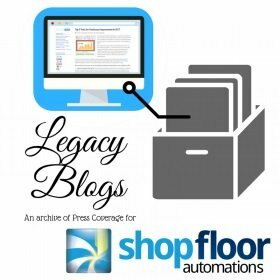 We also take the same care in preserving our past press appearances, so we welcome you to our Legacy SFA Blog Series from the Shop Floor Automations blog! Manufacturing News, October 2016 – page 35 (for the West issue) – In this issue, we talk about Predator Touch HMI and why it will benefit your shop floor manufacturing needs. The machine monitoring, big button interface is a program we have been excited to share with the public the past few months, and we are glad the manufacturing publications are helping us spread the word. Read the piece from MFG News. Modern Machine Shop, October 2016 – on page 149 (and on their website) – We got to talk further here about Predator’s Touch HMI. “The HMI is designed to provide an easier way for operators on the shop floor to interact with management and Predator Software. Shop Floor Automations can customize color coding, layouts, prompts and third-party applications.” We invite you to read more. American Machinist, November 2016 – on their website – our new WiFi USB Connect product is featured. The post states “The device serves as an easy and economic shop floor upgrade. Data can be stored on a remote PC, or locally in the device’s memory, with the device itself providing up to 128 MB of storage.” Read more. Speaking of Modern Machine Shop, they also published a piece on our new creation, Shop Floor Man, in early November 2016! “With an eye toward a younger manufacturing audience, the company has launched a Web comic series called ‘Shop Floor Man Presents’ with the intention of carving out a space for manufacturing-related humor on social media, especially Twitter.” Read the piece. Want more information on our hardware, software and support solutions? Call (877) 611-5825 to tell us what is going on with your shop floor! You can also fill out a contact form.